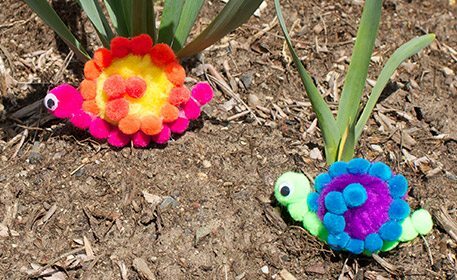 Snails may be slow and slimy, but when they're made from poms, they're cute, vibrant and fluffy! Start with a 3″ pom as the snail’s shell. Begin adding the spiral by gluing a 1/2″ pom to the side. Continue gluing 1/2″ poms around the edge of the 3″ pom, then bring it into the middle to create a spiral, as shown. Glue a 1/2″ pom to a 1″ pom. Attach the poms from the previous step to the snail’s shell, as shown. Glue 1/2″ poms to the end of the snail’s head to create the rest of the body. Complete your snail with a wiggly eye on each side of the 1″ pom!